The Otter Trooper LT 30 Soft Cooler shares several impressive attributes with other popular soft coolers, but solely carries a feature the others can’t match. Numerous coolers from soft to hard, and even wheeled, have graced my soccer fields, camping trips, and fishing excursions. The fact is that most premium coolers are more than sufficient in keeping ice, drinks, and food cold enough to please. The Trooper LT 30’s core offering is solidly seated within this vein. Unlatchable with one hand and unfolding much like a change-purse, the Trooper LT 30's mouth is wide when open and completely water-tight when shut. I fit five pounds of ice and 12 beers with room to spare. Opening the cooler a few times each day to extract a drink, it kept truly cold for three days as promised. Some ice still remained when I was finally out of booze and dumped the ice water a few hours past the three day mark. While this performance is great, several other coolers I own perform just as well. 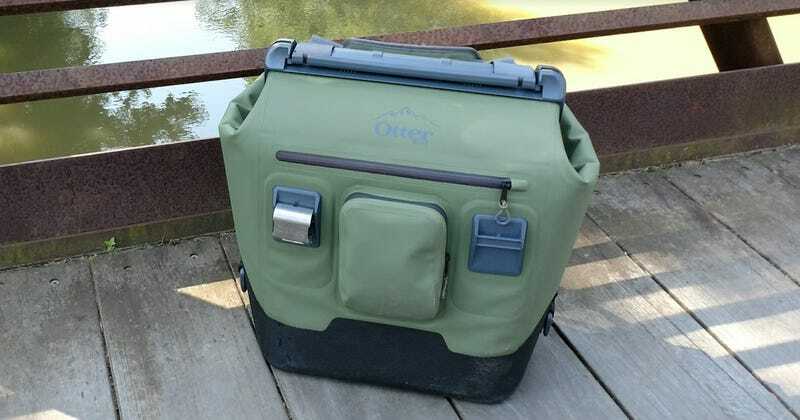 You buy the Otter Trooper LT 30 cooler not because it is like other great coolers, but because it’s also engineered to be toted with infinitesimal hassle. It converts from shoulder carry to backpack in seconds, and is comfortable to use in each configuration. Otter adds two modular accessory clips and even includes the accessory you’ll likely need most - a bottle opener. It’s fair to say that I’m more skeptical of gimmicks than most consumers. Otter’s backpack cooler, while a bit odd to behold bobbing down a trail on someone’s back, is no gimmick. That same someone might also be taking a photo, carrying fishing gear, lugging a duffel bag and a sack of soccer balls, clutching a dozen full grocery bags, or even eating a sandwich... with both hands! That someone was me. It was a liberating experience each time. By granting my hands freedom to carry other things or do other stuff, the Otter Trooper LT 30 soft cooler simply makes my life easier every time I have use for a cooler. Competitively priced at $300, it will do the same for you.